Search all Irvine home listings or utilize our comprehensive Irvine Rental MLS search tool. Get up-to-date daily email alerts of new homes, condos, multi-units, foreclosures, and land as soon as they hit the market along with price change notifications. Irvine is known for being the consecutive winner of the "Safest City in America" with a population of over 100,000 people. Not only is Irvine safe, it has the optimal infrastructure for several top Fortune 500 companies such as: Western Digital, Broadcom, Spectrum Group International, and Allergan which have several thousand employees. The University of Irvine contributes to the development and personality of the city of Irvine with a student body of 28,000 and a recent addition of the School of Law for graduate students. The prestigious academics and beautiful local surroundings contribute to the improvement and expansion of the campus in the Irvine community. The local communities close to UCI campus are: University Town Center, University Park, Rancho San Joaquin, Airport Area, and Turtle Rock. As a resident of Irvine and being a Real Estate Investor, I would highly recommend checking out my House Your UCI Student For Free Program. Living in a car dependent society, being centrally located is essential. Irvine has access to several freeways: 405, 55, 133, and 73 toll roads which allows for residents to drive to other parts of the surrounding Orange County area. Of all the cities in Orange County, Irvine has a diverse collection of many cultures and backgrounds that contributes to the unique nature of the city. Just as beautifully diverse as the city's residents, is the diverse selection of housing available. Residents have the ability to choose from metropolitan high rise luxury condos to gated community estates with sprawling views of the canyons and mountains. Several Award winning schools have made the community of Irvine an ideal place to raise a family. As all families value education, Irvine students continue to prosper and achieve significantly above the average American student with higher graduation and eventual college graduation statistics. Will Ferrell is an example of just some of the numerous successful Irvine students out there. University High School (where Will Ferrell graduated) is near UCI in the Turtle Rock area is featured as #8 in Newsweeks' list of Best High Schools. 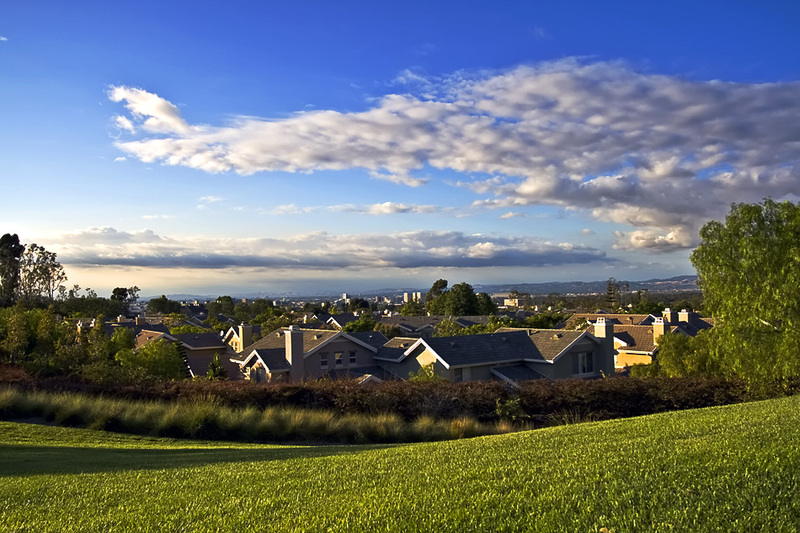 Besides it's academic flare, Irvine has a natural beauty of it's own that exudes through rock formations, luscious valleys, natural canyons, rolling hills, and panoramic views of Orange County. Biking and hiking enthusiasts enjoy challenging trails with undisturbed wildlife and preserved landscapes. The City of Irvine has current plans in the works to develop the former El Toro marine base into the Great Park which is planned to rival New York City's Central Park's splendor. The Great Park features a bright orange hot air balloon that locals can ride free to oversee the city from elevated heights. Residents are privy to a selection of the most reknown Orange County golf courses: Shady Canyon, Strawberry Farms, Oak Creek, Rancho San Joaquin, and El Toro. These golf courses also have local communities surrounding them, respectively: Shady Canyon, Turtle Rock, Rancho San Joaquin, and Portola Springs. The entertainment Irvine provides is exemplified by the well appointed collection of entertainment and shopping centers: the Spectrum, Verizon Ampitheatre, Tustin/Irvine Marketplace, and The District. People enjoy a variety of restaurants, modern movie theatres with IMAX, and world class shopping. As a resident of 8 years in Irvine, I have developed significant community and local market knowledge. I enjoy living in Irvine and would like to share my expertise as a real estate professional and local resident with buyers and sellers alike. You should use a Realtor with the background to give you the relevant and accurate information to facilitate the best decision when it comes to selling or buying your home in Irvine.